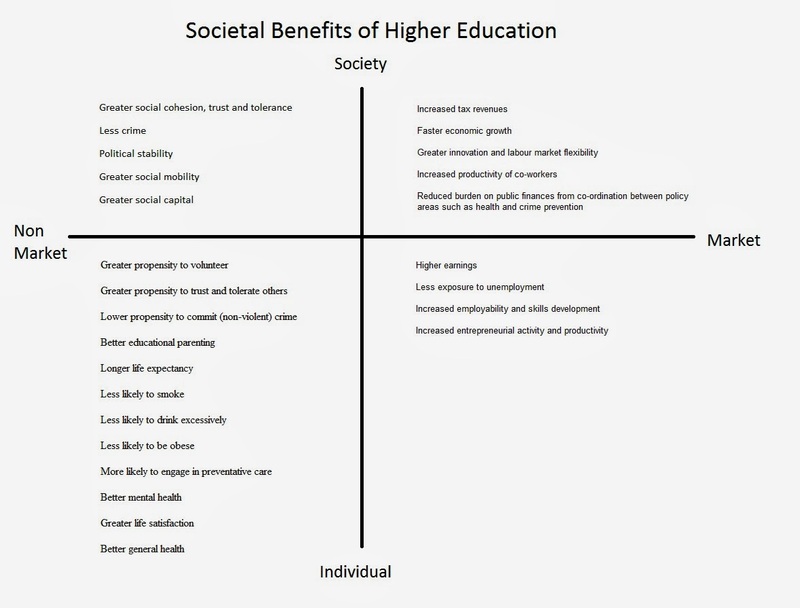 A British report on Higher Education entitled the “Quadrants” helps bring forward the idea that higher education has many secondary benefits beyond earning higher incomes. Education is often a process of learning about how to make money but it can also be seen as a process of personal enrichment. According to the November report from the UK Department for Business and Innovation Skills this enrichment makes its way into society in substantial ways. 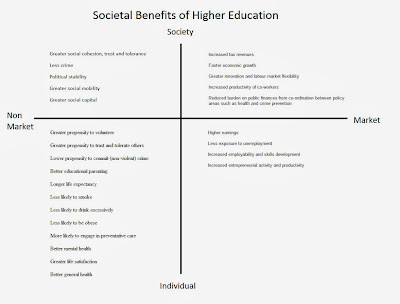 Direct benefits of education often include characteristics, social interaction, and accreditation and signaling benefits. The person develops to a higher level through advanced education. They are more able to deal with others as well as stronger in their marketability. Likewise, their personal characteristics become enhanced. An increase in the educational attainment in society has a marked wider benefit for society itself. Crime statistics, health, happiness, and just about everything else improves. Societal conflict decreases as members are more capable in understand differences. They are also generally less angry with immigrants and can navigate a way to deal with others. This ability to see other perspectives increases civil activity and social cohesiveness. Businesses are particularly interested in economic growth and development. Approximately 20% of UK growth between 1982 and 2005 was a result of higher graduate skill levels. As each percentage point of society (1%) becomes educated the long-run productivity increases between .2% and .5%. On a higher level this means that 1/3rd of all labor productivity between 1994 and 2005 were a result of higher education. The argument the report brings forward is that graduates in the regional economies improve the economy and lifestyles more than their expenses. This would mean there is an advantage to encouraging students to get an education and then work within the market they graduated from. Retaining these students within the country improves productivity and economic activity. The three industries that seem to hire more graduates are innovative firms that engage in research, financial industries and creative industries. Innovative firm’s hire science graduates while financial and creative industries hire graduates from other areas. Those industries that are innovative, financial oriented or creative hire over double the graduates than other industries. For those who seek to spark higher levels of entrepreneurship it is important to consider the report’s findings that higher educated people are more likely to engage in entrepreneurial activity. The productivity and training gains are twice the rise of wages which means companies get a higher return rate. The economy has an easier time expanding when there is a willing and education workforce to do the heavy lifting.